You are a human in the land of ooo but you are in poverty and live on the streets, since you are poor you have resorted to stealing. You are unaware that there is another human in the land of ooo, but you are about to meet him. This is the lovestory between you and Gumball Watterson! Although they are animalistic and object-like characters, their appearance will be somewhat close to humans. In each chapter with more characters introduced, I will also add their appearance too. Hope you enjoy this book! Y/n wakes up after being frozen for years. Startled by the lack of humans on Earth and sudden appearance of many different creatures she searches for answers, but will something stronger than answers get in her way? Mabye... Love? DISCLAIMER: IT WAS WRITTEN IN 2015! I WAS 12 OK! SO DON'T JUDGE MY WRITING! You are (y/n) (l/n), a beautiful, brave, 15 year old human princess with an awesome shape-shifting sword. You arrive to Ooo hoping to escape your evil father. 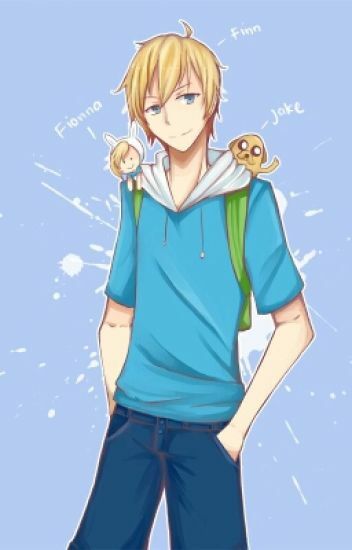 There, you meet Finn the human, Jake the dog and all their friends. You keep your royal status hidden because, you don't want anyone to find out your, in fact, a princess and have the possibility of your father finding you. You and finn have been best friends since you guys were 13. you are 18 now. though you guys don't know it, you both have had feelings for each other for a long time now. flame princess and finn just broke up and now its your chance to get him. what will happen next dear reader? find out! When you wake up alone, cold and confused in a magical looking land, knowing only your name and race, you stumble upon a boy and his magical dog. Who knew there was a spark between you and that boy with the bear hat? Adventure Time fan fiction with Finn!!!! what will happen? how will it happen? how do you get from this world to his world? who gets mad and or jealous? I guess you'll have to read to find out!!!!! !